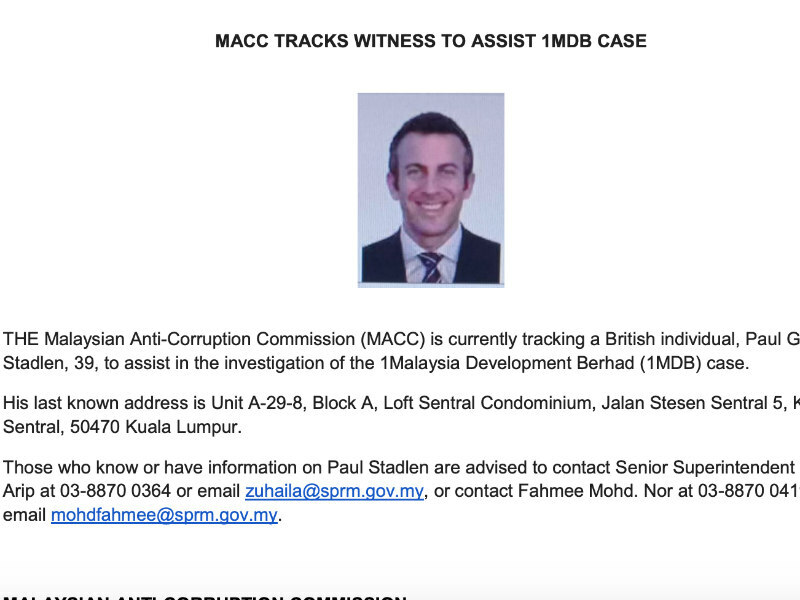 Paul Stadlen, widely viewed as former Malaysia PM Najib Razak's 'PR guru', is the latest wanted person in the 1Malaysia Development Bhd (1MDB) scandal. KUALA LUMPUR — Former APCO Malaysia MD Paul Stadlen is being sought by Malaysia's anti-corruption body in relation to the multi-billion-dollar financial scandal that helped bring down the country's previous government. The Malaysian Anti-Corruption Commission (MACC) issued a statement yesterday seeking the public’s help to track down Stadlen, who became a key PR aide for former PM Najib Razak after serving as APCO Malaysia MD around a decade ago. Razak is facing multiple charges of money-laundering and criminal breach of trust over the handling of the state-run 1Malaysia Development Berhad fund, which he created. MACC has suggested that Stadlen could be a key witness in the case. Stadlen's work at APCO Malaysia also garnered controversy, with the firm losing a lucrative government assignment because of its perceived links to Israel. The British national has since become a divisive figure in Malaysia, with the government forced to deny in 2015 that he received a state salary. Razak lost power in May in an electoral upset that was triggered by the 1MDB scandal. Since the election on 10 May, Stadlen has not responded to press queries, according to reports from Malaysia.